New Issue is Coming Soon! Welcome to the third issue of the “MATTER”, our scientific journal in metallurgy and mate- rials science dedicated to undergraduate students. With our third issue, I glad to announce that our founder, Y. Eren Kalay, has become the assistant to the president for university relations at METU. Nevertheless, he continues to support us as an academic advisor. In our current issue, we have 7 original research manuscripts. The two articles come from the interdisciplinary design studio of the university. Team ARTIFEX and Nos Curabit show us the success of this studio. Those of you who are interested in the truss structural systems for 154 kV trans- mission lines and rehabilitation methodology for children can enjoy those two articles. It can be easily seen that, this studio overcome the horizons of the interdisciplinary studying. The other article which belongs İpek Koçak comes from the Institute of Biomaterials, University of Erlangen, Germany. She is telling us the hints of the sol-gel process for bioactive glass making in bone tissue engineering. The paper submitted by Yiğithan Tufan, senior METE student, is on Gum Metal. He explains the structural and mechanical analysis of this multifunctional Ti alloy. The next study done by Furkan Türker is related to the development of strengthened steel for radiation shields. This interesting article shows us a different approach about nano scaled ferritic martensitic steels. The other article is a unique study about hydrogen separation in Pd- Ag binary alloys. This study is done by Elif Kaldırım and those of you who are interested in sputter deposition should definitely read it. The last paper belongs this issue is written by Büşra Aykaç and supported by TUBITAK and MEGAP. The research about electrocodeposition is done at Thermochemical and Electrochemical Material Processing Laboratories at METU. After the brief introduction of our papers, I should congratulate the students of METU College, the undergraduate researchers of the future, for their success at IGEM (International Genetically Engineered Machine) which is organized by Massachusetts Institute of Technology. They are awarded for their project about the cure of cancer. I convey my best wishes to them. Before I conclude up, I want to mention about one thing. Years ago, we decided to get on this road. When I looked the past, I have seen an amazing progress. We started as a first and the only undergraduate research journal of Turkey. Then, we kept proving that it can be done by undergraduate students at our all issues. From now on, we are still the one and we keep trying to be better than that. Finally, I would like to thank our editor team and our advisor for their help and support. We hope you enjoy reading the issue. 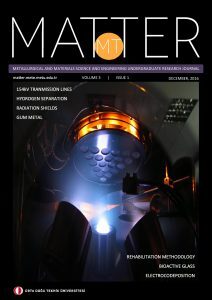 Matter is an open access undergraduate research journal published one issues per year. The journal accepts submissions from undergarduate students working in the area of metallurgy and materials research. The aim of Matter is to provide an online platform for undergraduate students to publish their own research and thus prepare for graduate peer-reviweved publications. This platform gives the students the opportunity to share their original research activities beyond the classroom.